Members of 'CODEPINK' held a protest after an Okinawan woman was allegedly murdered by a U.S. military civilian, outside Union Station in Washington, D.C., on May 26. 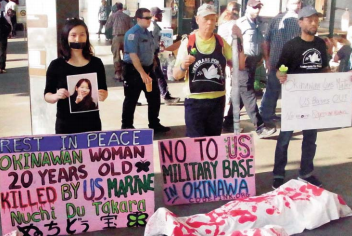 By Sakae Toiyama in Washington, D.C.
On May 26, in Washington, D.C., ‘CODEPINK’, a women’s group seeking peace and social justice, held a protest after an Okinawa woman was allegedly murdered by a U.S. civilian base worker, who is a former U.S. marine. Members demanded removal of U.S. bases from Okinawa in silent protest, holding placards saying “NO TO U.S. MILITARY BASE IN OKINAWA”. They expressed their deep anger and sorrow, holding portraits of the victim. Some of them held a ‘die-in’ protest, covering themselves in mock shrouds painted with fake blood. Alice Kurima Newberry, a member of CODEPINK, whose mother is from Okinawa, planned the action. Members of citizens groups, including Veterans for Peace, Steve Rabson, a professor emeritus at Brown University and an advocate of intellectuals opposing construction of a new U.S. base in Henoko, and Stephanie Ortoleva, a human rights lawyer and the president of Women Enabled International, took part in the protest action. Newberry sealed her mouth with black tape, as a symbol of Okinawan people’s voice not being heard by the U.S. citizens and the government. Rabson said the governments of Japan and the United States should take action and listen to the voice of Okinawa. He added that only apologizing would not help resolve the issue. Ortoleva stressed that there was no other way but to withdraw U.S. troops from Okinawa because violence against women can happen wherever U.S. bases are located.